Hello everyone! So many exciting things are happening in the month of August at the Volunteer Center that I can hardly contain myself! I encourage you to check out the website at http://volunteercentersn.org/ and see for yourself! Register to volunteer if any of these catch your eye. -The KLAS 8 on Your Side Help Fair is happening August 11th. Tons of good information to take advantage of! If you can’t make it to the fair for information go to www.nevada211.org for information on how to get help! If any of these opportunities sound interesting to you – PLEASE register with the Volunteer Center and sign up! It’s going to be a great time and of course, it is going to help your neighbors!!!! So I didn’t volunteer last night but I do have a cool AmeriCorps story. Let me share. The conversation continued from there. But at the end he thanked me for my service and told me to keep doing good work! Such a great thing to hear on a Monday afternoon. On Saturday July 25th I volunteered at the North Las Vegas HOPE NOW event at the Aliante Station. The City of North Las Vegas, NeighborWorks America, and The HOPE NOW Alliance partnered for the fantastic event. NeighborWorks is a national nonprofit organization created by Congress to provide financial support, technical assistance, and training for community-based revitalization efforts. They create opportunities for people to live in affordable homes, improve their lives and strengthen their communities. HOPE NOW is an alliance between counselors, mortgage companies, investors, and other mortgage market participants. This alliance maximizes outreach efforts to homeowners in distress to help them stay in their homes and creates a unified, coordinated plan to reach and help as many homeowners as possible. The members of this alliance recognize that by working together, they will be more effective than by working independently. There were hundreds of attendants and many different banks and lenders there also. The fair was intended to put homeowners, lenders, and non-profit counselors face to face in order for homeowners to receive assistance with their loans. With so many homeowners struggling to make their mortgage in the Las Vegas valley, this event gave hope to Valley residents. The attendants came in a bit frustrated, understandably in these economic times, but many left feeling relieved and grateful for the help they were given. The day went by quickly and I really enjoyed volunteering at this event. I met some great people that gave up their days on Friday and Saturday to volunteer. Las Vegas residents are continuing to amaze me with their generosity and kindness. There were lenders there from all over the country too. Flying and traveling to help out homeowners in trouble – how amazing! The event was well coordinated and as a volunteer, I felt it was very structured and organized. (A must at such a huge event) Kudos to Sheila Squier for her amazing work and patience! I even got a cool, new t-shirt (and free food) for volunteering! It was a really busy day so I didn’t get to take pictures, but next time I’ll be sure to stop and snap some. I also just got word that we helped 1569 homeowners this weekend!!!! If you would like to volunteer for events like this click here. If you, or anyone you know, are interested in NeighborWorks click here. For information on HOPE NOW click here. So this isn’t a volunteering post, exactly, BUT I wanted to share The Volunteer Center’s success! 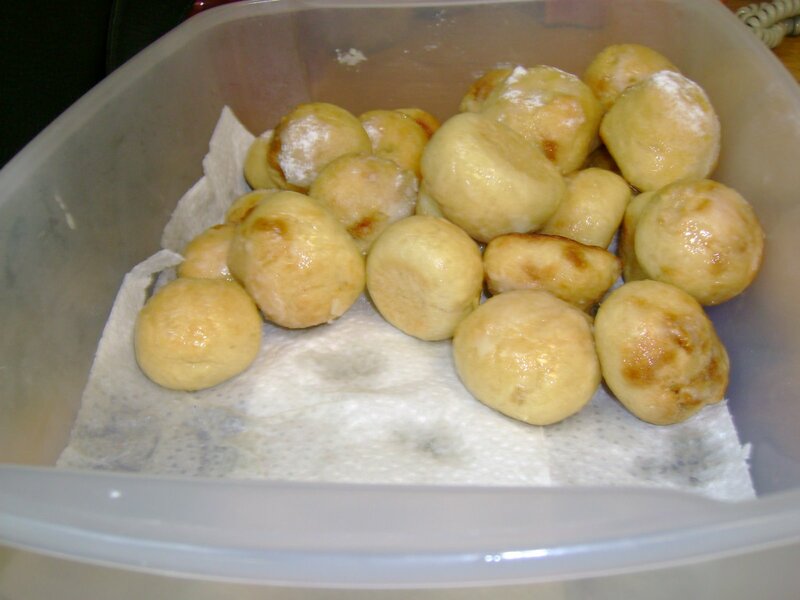 So for the lunch, I made Vegan Baked Doughnuts from scratch (that’s what this post is really about – to brag). Mind you, I am no chef or baker, but lately I’ve been inspired to try new things. And our Brown Bag had to beat everyone else’s… so I went all out! We presented great information and made it short and sweet so everyone could enjoy their lunch hour. My co-workers also brought cookies for everyone. Best Brown Bag ever. Below are pictures of the entire VC staff, Big T and myself (of course!) and my doughnuts!!! Which, by the way, I even got compliments on! I’m so happy to be a part of this team and contribute the skills and passion I have. Go V.C! Help homeowners get help from lenders, face to face and free of charge! So if you’re in need of mortgage assistance come out and get info! Or sign up to volunteer! North Las Vegas HOPE NOW event, Friday July 24th from 2:00 – 8:00 pm and Saturday, July 25th from 9:00 am – 2:00 pm at the Aliante Station and Casino. Serve a warm and delicious meal to the homeless. It’s from 6:15-7:30, a quick but fabulous opportunity to help your neighbors! Visit the Volunteer Center to register and sign up. Boys Hope Girls Hope Cirque du Soleil has donated bookshelves for the BHGH house and now they need your help to fill them with your favorite literary classics! On July 25th, Barnes and Noble will donate a portion of their sales to BHGH when presented with a voucher. The staff and scholars of Boys Hope Girls Hope will be at the Barnes and Noble at the Rainbow Promenade (2191 N Rainbow Blvd.) from 11 am- 3 pm, however the voucher is good for any Barnes and Noble in the Las Vegas Valley! If you’d like the voucher or further information please email me. Other than that, I’ll be again blogging soon so stay connected. My weekend was pretty awesome. Friday night Big T, myself, and Heather went to the Face to Face(book) event which was very cool! It was held at Studio 8 Ten in downtown Las Vegas and the studio itself has an awesome story. And Saturday night I got to volunteer for Foundation for Recovery’s Art Auction. Studio 8 Ten partners with Transition Services to offer job training to people with disabilities. Ranging from retail sales, soap-making, card-making, to many other arts and crafts. The studio then sells these pieces in their gift shop. The Face to Face(book) event displayed and sold local artist’s art. Le Cordon Bleu catered and Missing Blind performed. The event was a nice change in pace in that it was in an art gallery (in Vegas no less), helping out our neighbors, and educating the community on the needs of Transition Services and it’s clients. Oh yeah, and the free food from Le Cordon Bleu was FABULOUS! Saturday night was another great night for me. I volunteered at the Foundation for Recovery Art Auction held at the TAM Alumni Center at UNLV. Foundation for Recovery is an organization which assists people with addictions of all kinds in getting another chance at life! Through donations and fundraising the organization is enabled to help with treatment for their growing clientele. Attendees got to view the donated art in second floor art gallery (which if you haven’t checked it out – swing by and see the great space). While enjoying finger foods and beverages the Green Valley Highschool Jazz Band played and later, an acapella group entertained us. The auction went well, with all the pieces being sold and raising hundreds of dollars. Plus I even got to take some cookies home. Just my kind of event. If you, or anyone you know, could benefit from Transition Services call 702-644-9418. Studio 8 Ten is located at 810 South Las Vegas Blvd.Las Vegas, NV 89101702 and is open M-F 10-6. 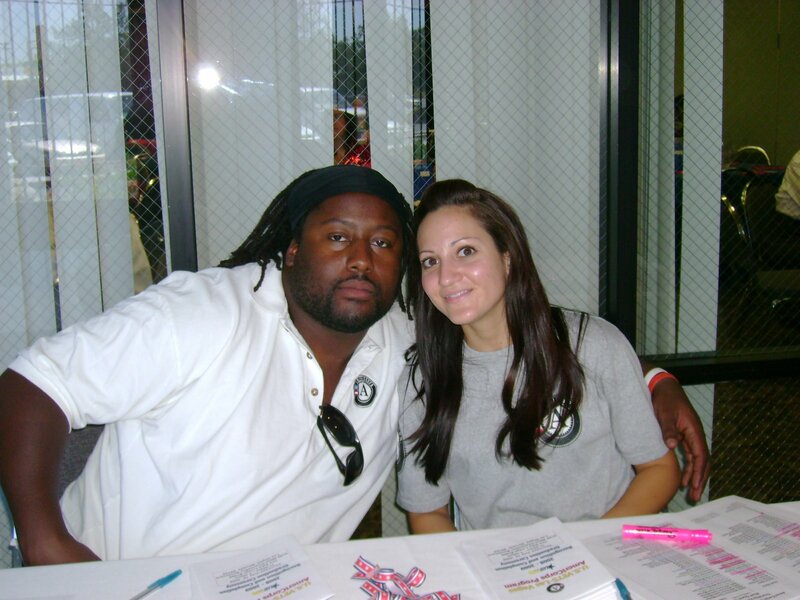 To volunteer for events such as the Foundation for Recovery Art Auction click here. The AmeriCorps members that served at US Vets served full-time positions. As I described in my July 9th post about the Dina Titus visit, US Vets is a great program that provides housing, counseling, job assistance, and HOPE to thousands of homeless veterans each year. They have 257 beds for homeless veterans!!! Their programs foster the skills necessary for every veteran to return to the community and remain self-sufficient. The facility is not only efficient, but it’s also very well maintained. The AmeriCorps members work at all different levels and capacities, wearing many different hats and helping in all sorts of ways. 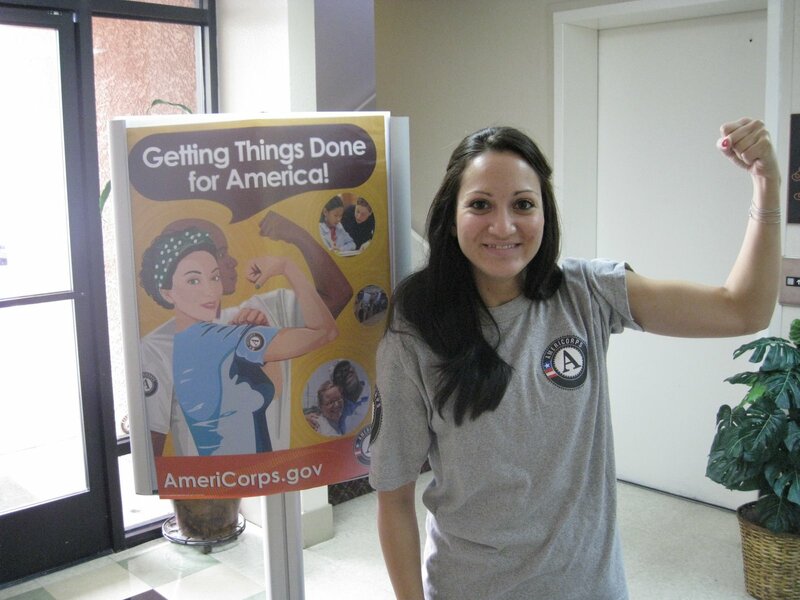 Without AmeriCorps members, US Vets employees would have a lot more on their hands. Today was the member’s graduation from the program and it was set up beautifully by Karen Lewis, the program director. The Nellis Air Force Base Honor Guard did a presentation of colors, an AmeriCorps member sang the National Anthem and there were also guest speakers. Everyone was able to be congratulated and recognized for their service to US Vets and rightfully so! Congrats go to James Austin, Andrea Canales, Jessica Harakidas, Colby Mortensen, Jessica Park, Sonja Ramirez, Kristi Swenson, Steven Basmajian, Ray Foliente, Luis Molina, Lynn Oakley, Olwyn Pruitt, Caralynn Scala, Desiree Tennant for serving. And congrats to Karen Lewis for organizing a great event!!! You are currently browsing the United Way of Southern Nevada Volunteer Center blog archives for July, 2009.